In these exercises, Dr. Tracy Steen and I examined how red and cyan stereoptic filtering can be used to place two-dimensional objects in the foreground, midground, or background of a painting. To view the paintings with the added depth of stereopsis, wear 3D glasses with red and cyan tinted lenses. For the exhibit, we explained the neurological reasons why red and cyan 3D glasses work. These paintings were exhibited from July to November 2011 at Giant Steps Gallery in the Rittenhouse Square neighborhood of Philadelphia. Star. Spray paint on Plexiglas. 48 x 48 in. 2011. This painting is a two-sided abstraction. One side, when viewed through 3D glasses, depicts a star exploding as it becomes a supernova. The reverse side, when viewed through 3D glasses, depicts a star collapsing into a black hole. This exercise demonstrates how an artist can use red and cyan outlining to manipulate the position of objects relative to the viewer. When the placement of the red and cyan outlines are reversed, objects that were previously in the foreground are now in the background. Similarly, objects that were in the background appear to be in the foreground. The transparent surface of the painting allows the viewer to flip the painting from front to back, watching the exploding star transform into a collapsing black hole. Telephone Wires. Spray paint on artificial brick. 48 x 72 in. 2011. This painting depicts a bird about to land on a telephone wire. In the background the sun peeks through a dark cloud. The exercise blends red-cyan stereoptic filtration with traditional techniques used by artists to convey depth. The sense that there is atmospheric haze between the viewer and the cloud gives the impression that the cloud is far away. Gradation in the dark parts of the cloud defines the cloud’s shape. The painting employs another traditional depth cue—occlusion—to give the impression that the telephone pole, the wires, and the bird are closer than the cloud because the cloud appears to be partially obscured by those objects. A slight angle to the wires conveys depth through perspective. The wires appear to be receding into a vanishing point. Without 3D glasses, however, the painting is still missing two of the depth cues by which our brains typically and automatically calculate depth: stereopsis and relative motion. With the 3D glasses, a stereoptic illusion is created that adds depth and clarity to the painting. The two sets of telephone wires are more easily distinguished, and it becomes more obvious that the bird is preparing to land on wires in the foreground. Eye Chart. Spray paint on artificial brick. 48 x 36 in. 2011. 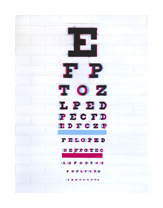 This painting plays with the appearance of letters on a typical eye chart. Because of perspective, a technique used by artists to convey depth, the larger letters appear to be closer to the viewer than the smaller letters when viewed without 3D glasses. With the 3D glasses, letters shift to the foreground or background without regard to their size. In addition, by painting red and cyan on a light background, the image that each filtered eye sees is a dark image (the opposite of the effect achieved in Orion). Orion. Spray paint on artificial brick. 48 x 48 in. 2011. This painting depicts Orion, one of the most recognizable constellations. When looking at the night sky, we do not have a sense of three dimensions because the stars are too distant to provide meaningful information about depth. In reality, stars are light years apart, but this distance is not obvious to the naked eye. When gazing at a seemingly flat night sky, we naturally group clusters of bright stars together. Even without prior knowledge of the names and mythological stories associated with constellations, most stargazers look for recognizable patterns in the stars. The 3D effect allows us to experience the stars with the addition of stereoptic depth. That which we normally see in two dimensions we can now experience in three. Without the 3D glasses, we see separate red and cyan stars with overlapping borders. With the 3D glasses, each eye receives an image of white stars against a black background. Through the red-filtered eye, the red stars turn white and the cyan stars turn black (and consequently blend into the black background). Through the cyan-filtered eye, the cyan stars turn white and the red stars turn black (and consequently blend into the black background). In this way, the brain is presented with two, slightly separate images of the stars. Through the process of stereopsis, the images are compared and the differences are mistakenly attributed to depth, not 3D glasses. Sometimes mistakes have beautiful results: With 3D glasses on, the constellation Orion appears to float in the foreground.